Give your youth a bed to grow with by bringing home the Aura platform bed with storage base. The platform bed not only has a very handsome leather headboard, but it also has hip floating metal sides to act as a bedside table. The platform base of the bed stands on circular tapered legs accented with brushed nickel and features six drawers with metal hardware for you child to store extra pillows, blankets, shoes, socks, or boardgames in to keep them tidily tucked away. 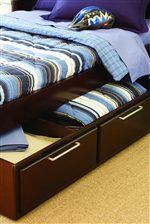 Fashionable and functional, both you and your child are sure to love the Aura platform storage bed. This bed is available in Twin and Full sizes. The Aura Twin-Size Platform Bed with Storage Base by Opus Designs at AHFA in the area. Product availability may vary. Contact us for the most current availability on this product. 756-10-939 3/3 Platform Drawers 1 42" 77" 15"
756-10-938 Twin Leather Headboard 1 43.25" 5" 37"
Finish Aura features a non-toxic deep, rich Merlot finish. Handles & Hardware This collection features contemporary brushed nickel hardware and accents to create a breathtaking look. Hardware designs add beauty and functionality to each collection. 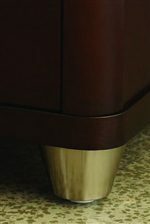 Case Detail Round and round tapered bases in the Aura collection are standout bases finished in brushed nickle. Drawer / Shelf Construction All wood drawers with English dovetailed construction and maple veneer bottoms. Solid five-sided drawers provide more depth and width for greater storage volume. Wood corner support blocks on all drawers. Drawer Suspension All drawers include full extension metal ball bearing side guides for greater drawer stability. Additional drawer reinforcement blocks and center support increase structural strength and durability. Description: Top Fully finished tops to complete the pieces. Case Construction Mortise and Tenon construction. Solid wood and wood veneer construction. Screwed on wood back panels. Adjustable levelers on door pieces. Composed of solid wood and wood veneers. Use of veneers enables more decorative looks unattainable with solid wood. Give your youth a bedroom they will love at any age with Aura. This contemporary collection is decidedly hip and sophisticated to please even the coolest teen or adult. 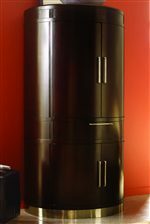 It features a deep, rich merlot finish with brushed nickel accents to create a breathtaking look that will bring its own unique aura to today's interiors. Best of all, it is design to grow with your child, offering items such as twin and full beds, underbed storage drawers, space-saving chests, a distinctive desk, and unique round armoire. All of these pieces, used separate or together, will bring just the right ambiance to any teenager's room. Both you and your child are sure to love the style, sophistication, and purposefulness the Aura collection will bring to your home. The Aura collection is a great option if you are looking for Contemporary furniture in the area. Browse other items in the Aura collection from AHFA in the area.